When I started riding my bike for transportation it took a while for it to become a daily habit. Once it did, my mindset was no longer that of a person who drives without thinking about it. If I didn’t get on my bike I usually got on the bus. Psychologically I was no longer a driver, although I drove when I needed to. Getting back into the car thanks to my broken elbow undid some of those changes to my mental landscape. The few times I got on the bike it felt really great and I remembered how much I wanted to ride but then my shoulder and elbow would ache by the end of the ride, or later that night, and I’d feel I needed to give it a rest. It’s been long enough, and the first week of 30 Days of Biking helped me make sure of that. A couple of days of longer sustained mileage and some days of short dashes to meetings, along with changing up the bike I rode to change the stresses, made for a decent mix. Week 2 it started to feel natural again to turn to the bike; Week 3 that’s a for-sure. It’s more complicated to plan, given that I drive to Olympia 2-3 days a week, but I make sure I do. Saturday April 8: My Mary Poppins bike seemed like a nice choice for the ride to my massage appointment and grocery shopping — that is, until I had to peg back home as fast as I could to take Sweetie in for a check-up after he had a collision with a driver who failed to yield. I wished for my road bike on that return ride. 5.35 miles total under skies that gave me some sun, some cloud cover. Sunday April 9: After a delicious family brunch we had a long drive to Ellensburg and back so my bike time came later in the afternoon. I hopped on the road bike and noodled around the neighborhood a little bit to look at streets I don’t usually ride, walk or drive. This exploration yielded an alternate route to our house that I hadn’t realized was there and the chance to pause and look out at downtown Seattle. Around 1.2 miles. Monday April 10: My morning ride of 8.5 miles on my road bike let me enjoy the green of spring trees and a gorgeous blue sky. My route includes two sections with a lot of freight traffic: the Duwamish Trail and then a stretch that gives me the choice of a bike lane or the sidewalk along E. Marginal Way. Some days the latter has semi trucks lined up in the center turn lane waiting to enter the port, other days it’s all but empty. Tuesday April 11: Taking the front wheel off the road bike lets it fits into the back seat of the car I use for Olympia trips. I had two days of meetings so I found a friend willing to put me up for the night (or is that “put up with me for the night”?). Today’s riding included a dash from WSDOT headquarters to the office of the Traffic Safety Commission to spend a day reviewing grant applications for funding. Bike parking proved frustrating since I didn’t know the office building had two bike-art racks in an inner courtyard not visible from the side I entered. Sweetie had told me my chain needed replacement. Luckily the meeting got over early enough that I could drop the bike off at Deschutes River Cyclery in downtown Olympia, catch a bus back to the office, then reverse that at the end of the day to get the bike (which had also needed a new cassette). Nice ride to my host’s house: bike lane almost all the way, low traffic volume, with much of the distance along the edge of Capitol Lake. My bike joined a large bike herd in their garage. 6.39 miles today. Wednesday April 12: I rode back to the office through a light splatter of rain — not enough to be worth stopping to put on my Wander Wrap. I could have reversed last night’s route for the scenic option but since the skies threatened I took the more direct (but less pleasant) streets. 3.05 miles for the day. Thursday April 13: This day included a dash through the rain to a mid-afternoon meeting. I felt strong climbing up the 2nd Avenue protected bike lane, at first through sprinkles and then through a full-on blowing-in-my-face drenching rain. No matter; since I’m not the Wicked Witch of the West I don’t melt when water gets on me. 5 miles for the day. Friday April 14: Drove to Olympia for the day. When I got back I grabbed my bike and headed to hear Alec Baldwin with friend Andrea Learned. But as I rolled up the first block from my office I realized I was hearing a familiar bumping sound that meant a developing flat tire. Could I ignore it since I only had a mile to ride? About 3 blocks later I decided no, that was a bad idea. Fortunately this realization dawned on the same block as a transit stop, the bus arrived 1 minute after I got there, and in no time I was at the Paramount Theater settling in. 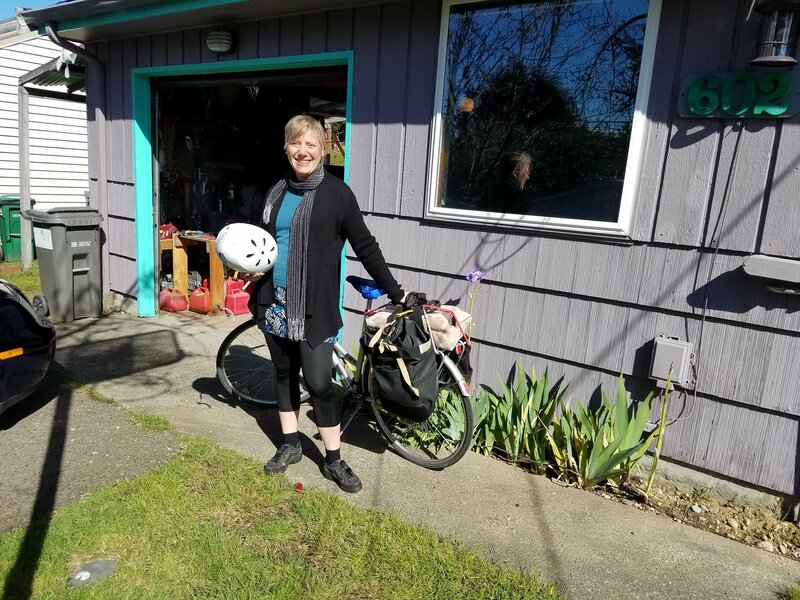 Saturday April 15: This was a fun one — biked in sunshine to my sweet sister-in-law’s house with a big pan of baked apple French toast bungied onto my back rack for a weekend visit with my younger sister down from Friday Harbor. After a great walk at Seahurst Park I biked home with a stop for groceries. 5.65 miles for the day. 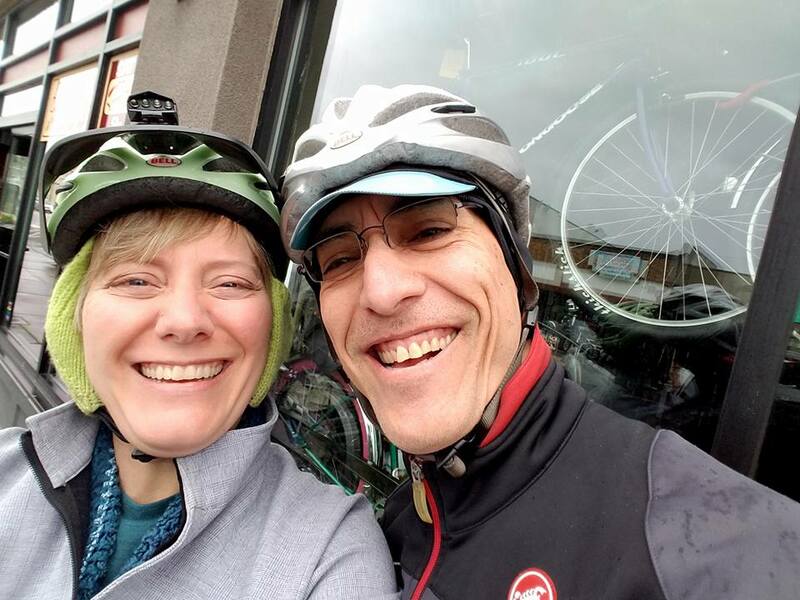 Sunday April 16: My sweetheart and I biked to brunch for more sister time. 3.67 miles. Monday April 17: Biked to work and to some meetings; 9.91 miles for the day. Tuesday April 18: This was a definite “check the box” day. I spent a long day in Olympia. When I got home I pulled Tessa out and started to pedal out of the driveway, absentmindedly forgetting that the chain had dropped off the last time I rode her. I turned around and headed back into the garage. It still counts — the wheels turned. Thursday April 20: Another of those fun “plan ahead so you can ride” days. Drove to Olympia with my road bike in the back seat on a rug, parked the car at headquarters, and rode to meetings, errands, and my overnight at a friend’s house in Tumwater. 4.7 miles. Saturday April 22: One of those days when you know you’ve earned “bikema” (it’s better than karma). The rain was really coming down when I set out to get a station wagon full of garden soil and big pots to put in some tomatoes and flowers. By the time I got home and did some unloading the sun was peeking out so I biked to the massage appointment for that darn frozen shoulder. While I lay on the table feeling knots being broken apart I heard the rain come pounding down again. By the time I finished massage and a stop for groceries the rain was gone again and I rode home through the fresh, clean air. 5.87 miles. Sunday April 23: Rode to a breakfast date with my sweetie. 3.3 miles.